This week has been a bit of a whirlwind. For someone who is happily content to exist within a 3-mile radius, I have traveled outside my usual stomping grounds on more than one occasion in the last seven days. But also enlightened and inspired. 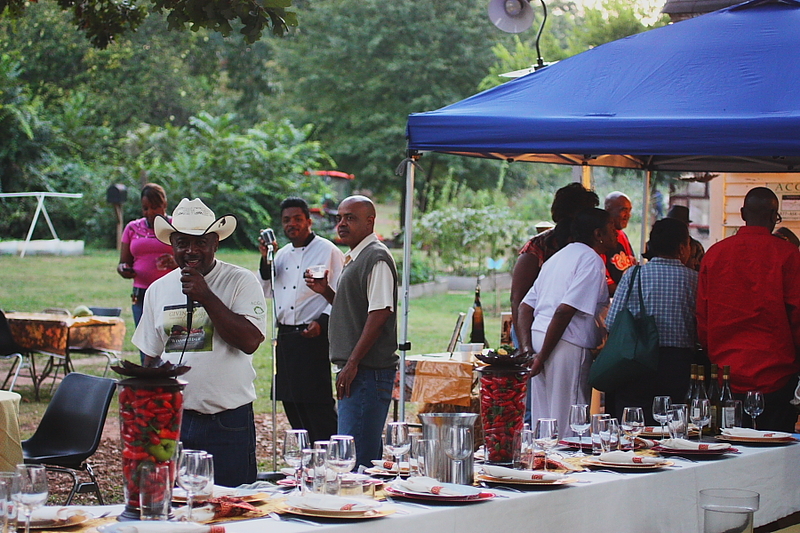 On September 20, I had the privilege of attending a communal dinner at the Metro Atlanta Urban Garden. 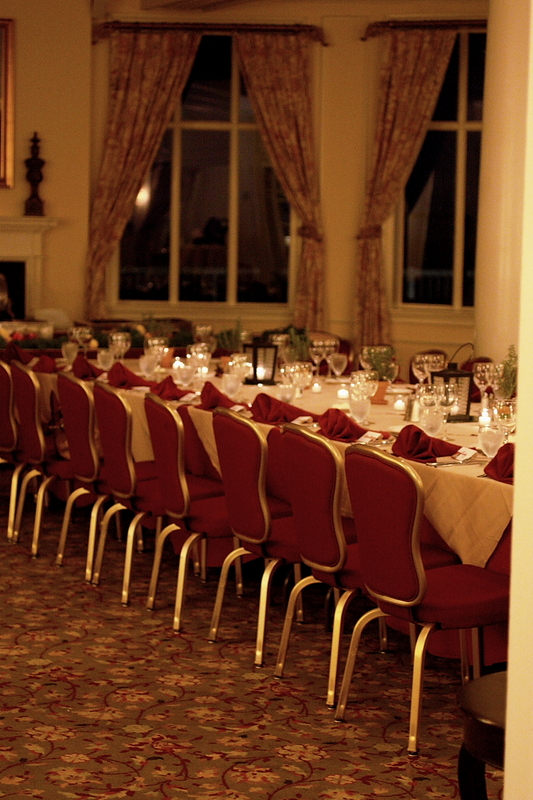 Sponsored by Woodbridge by Robert Mondavi’s Giving through Growing program, members of the Farm’s staff welcomed community members to dine with them in celebration of the amazing work being done there. Tucked away along a busy stretch of urban road in College Park, GA is this almost-five-acre working farm, complete with a Victorian-era farm house, caretaker’s cottage and original red barn, which serves as the support for their lovely greenhouse made from reclaimed windows. They are certified naturally grown, and they produce all of their own soil and compost on site. The farm is situated on a 300-foot deep well, from which they draw all of the water for irrigation. In the midst of a concrete jungle, there is this beautiful agricultural oasis. It’s like a different time and place. 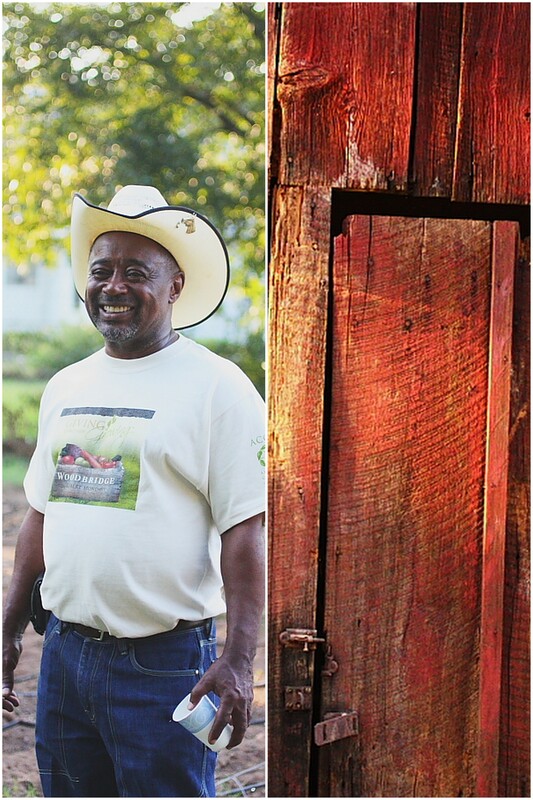 This is Bobby Wilson , President of the American Community Gardening Association, and co-founder of the Metro Atlanta Urban Farm. He was kind enough to give us a tour, and teach us a thing or two about community gardens and what a true gift they are to the people who have the opportunity to be involved with them. His passion for his work was evident as he talked about the therapeutic benefits of gardening, the way it brings people together, and the joy of reaping the fruits of your labor month after month. In this current position, as well as in a former role as the Program Director for The University of Georgia Cooperative Extension/Atlanta Urban Gardening Program, Bobby has offered gardening instruction and support to some three hundred gardens located at public housing complexes, shelters, schools, churches and elder care facilities in metro Atlanta. He has also been instrumental in securing the partnership with Woodbridge by Robert Mondavi, which resulted in an $8000 grant that allowed them to double the size of their community garden and install a drip irrigation system. It has also allowed them to donate a portion of the food grown in the community garden to the Atlanta Community Food Bank. Beyond supporting our own winery garden which was planted to produce fruits and vegetables for the Stockton San Joaquin Emergency Food Bank, Woodbridge by Robert Mondavi has granted $8,000 to five other gardens across the U.S. to undertake whatever is needed to produce more food –whether that’s building additional planter beds, improving watering systems, recruiting volunteers, or buying more fruit trees and vegetable seeds. All of the additional produce raised through this project will be donated to local food banks. It was a great party, celebrating a great program, and I felt so privileged to have been invited to attend. People who work in the garden, people who benefit from the garden and people who support the garden all came together to celebrate and dine together. It was a true testament to the role that gardens can play in benefiting and growing a community. 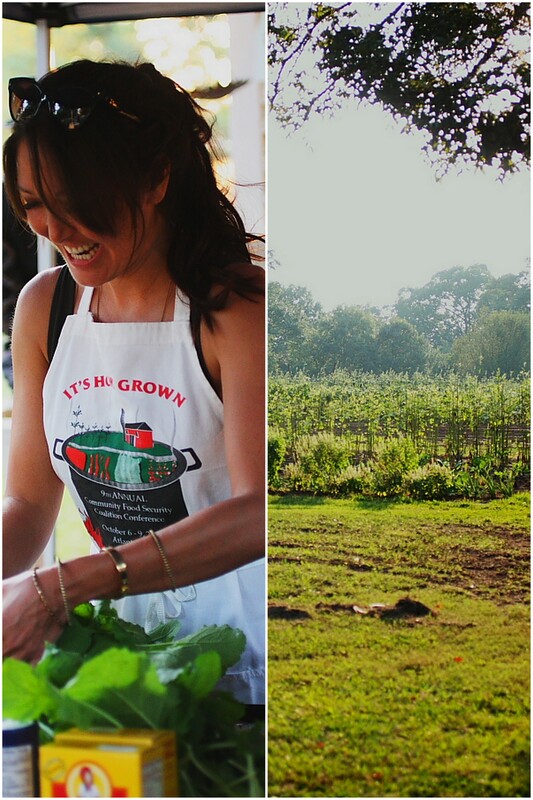 And knowing that a portion of the evening’s dinner was grown right on the property made it even more special. On Sunday, I introduced a friend of mine to one of my favorite places to shop for produce, outside of my own garden or my local farmer’s market (which is, sadly, closed for the season). For people in the Atlanta area, Your Dekalb Farmer’s Market is a great affordable alternative for fresh, local (sometimes, sometimes not so local) produce and meats. While I was there, I picked up some sweet white corn, tiny pencil-thin asparagus (which I realize is out of season here, but I just can’t resist those tender green stalks when I see them all lined up. Even if they came all the way from Peru), and some wild-caught Georgia shrimp. 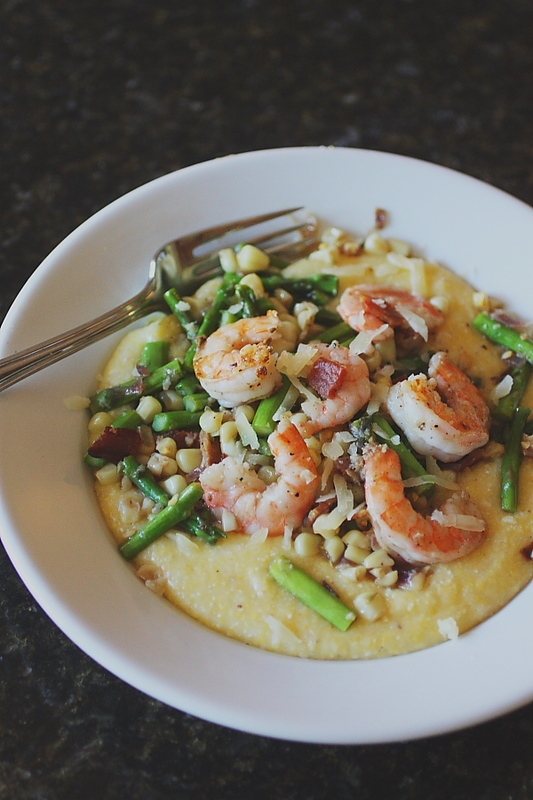 I still had some stone-ground grits in my freezer from Rockin’ S Farms, so I thought a Georgia shrimp and grits dish would be nice. I made a quick sauce using some of the Woodbridge Chardonnay that I received as a gift at the Farm celebration the other night. 1 bunch asparagus, cut into 1-inch pieces (you could easily sub some swiss chard or kale here if you want to keep this truly seasonal). Begin by cooking the bacon over medium-low heat, allowing the fat to cook out and the bacon to crisp up slowly. Remove the bacon from the pan, and pour the fat off into a heat-proof container. Crumble the bacon and set aside. Add a tablespoon of the bacon fat back to the pan, along with a tablespoon of butter. 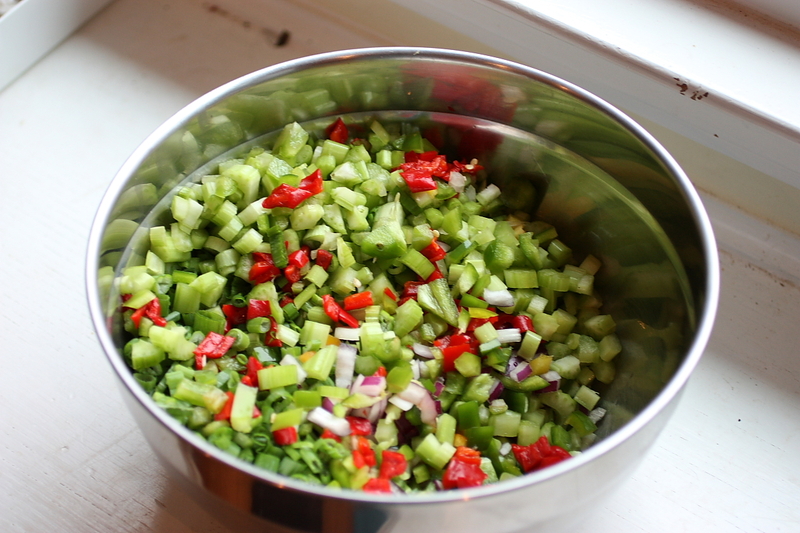 Increase the heat to medium and add the diced onion. Saute until translucent. Add the corn and the minced garlic. Saute until corn starts to brown slightly. 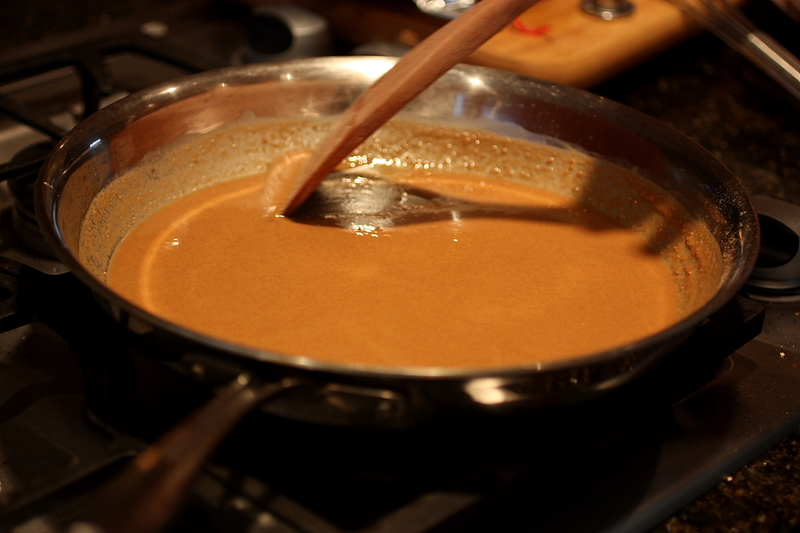 Pour 1/2 a cup of chardonnay into the pan and add a tablespoon of butter, whisking to combine. Season with salt and pepper to taste. 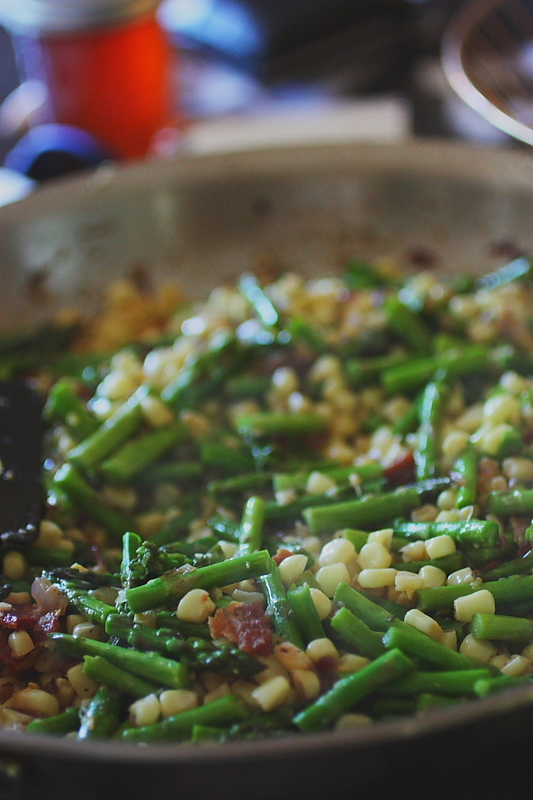 Remove from heat and add the asparagus. Cover and set aside – the asparagus will cook in the residual steam. Cook the grits according the package instructions (I do mine in liberally salted water, but you could also use chicken or vegetable stock). At the end of the cooking time, remove from heat and add a tablespoon of butter and the manchego cheese. Heat an iron skillet over medium-high heat. Add a tablespoon of the reserved bacon grease. Season the cleaned shrimp with salt and pepper. Cook in batches, approximately 1 1/2 minutes per side. 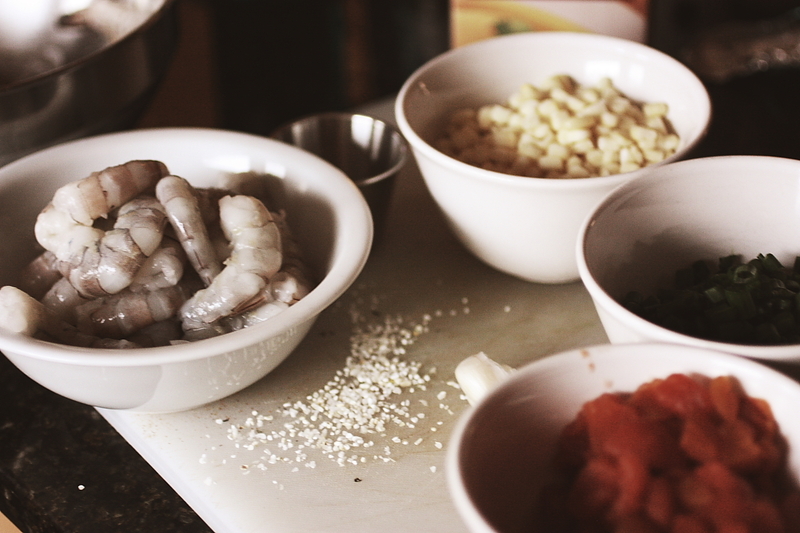 Deglaze the pan with the remaining chardonnay and add the shrimp back in. 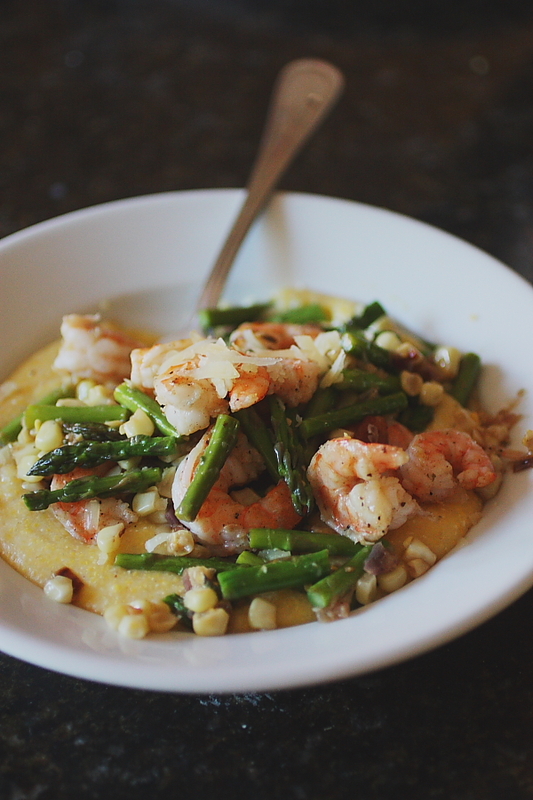 To serve, place about a cup of the cooked grits in the bottom of a bowl, then spoon the corn and asparagus mixture over the top, then place the shrimp on top of that. Garnish with crumbled bacon and additional manchego cheese if desired. 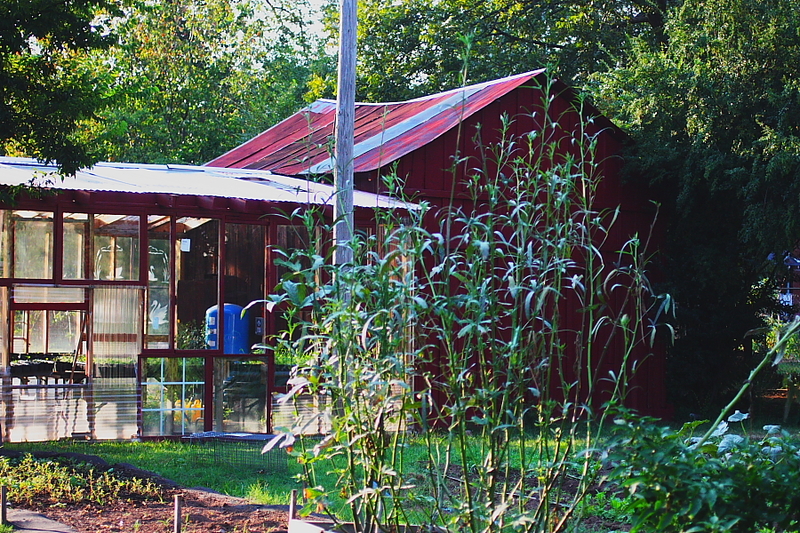 If you have a chance, I encourage you to visit the Metro Atlanta Urban Farm, or another community garden in your area. There’s a community garden finder tool on the Giving through Growing website. I think you’ll be surprised just how many of these communal gardens there are. There may even be one in your neighborhood. Get involved, and plant a row to donate to your local food pantry. If you’re interested in starting a community garden, Bobby and the folks at the American Community Gardening Association can help with that, too. A week or so ago, I packed a bag, grabbed my camera and laptop, and climbed in a car with my good friend, Rachel. We drove five hours south of Atlanta to St. Simons Island, Georgia for three nights and two days at the King and Prince Beach and Golf Resort. Rachel and I have traveled together many times over the years, and I can honestly say this was one of the best trips we’ve ever taken. It was a bit of a working vacation, as we had both been invited to attend a FAM trip focusing on the resort and their efforts to incorporate local and regional cuisine into their dining experiences. If you’re unfamiliar (ha!) with the term, FAM is short for “familiarization,” and these trips are often offered to travel writers and agents as a way for them to educate themselves about an area. 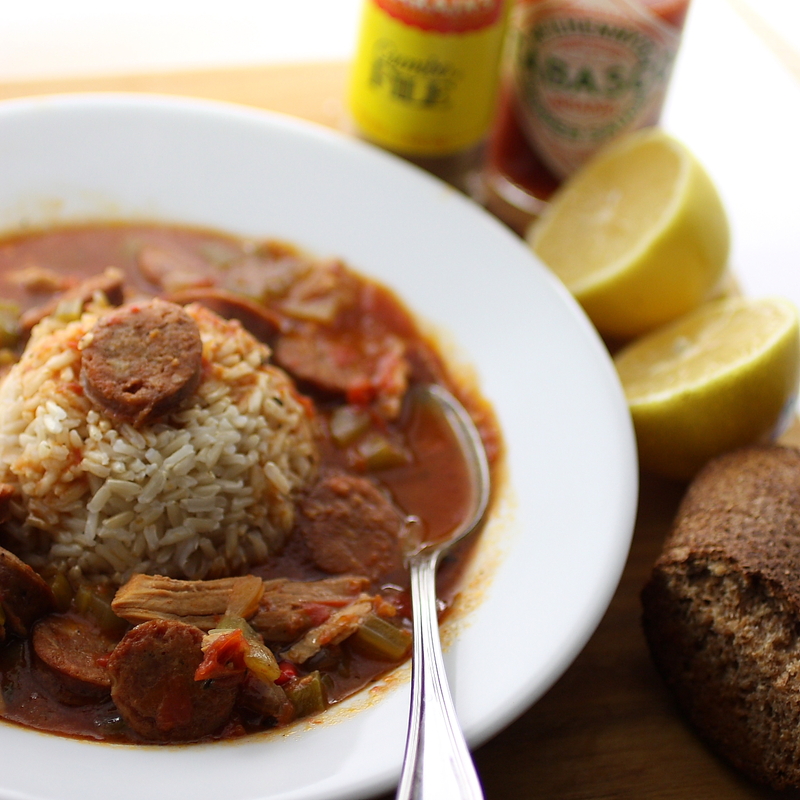 Obviously I am neither a travel writer nor a travel agent, but since this trip focused on Southern Culinary Traditions, they were also looking for writers who focused more on food. This is the first sponsored trip that I’ve been invited on, and I am admittedly a little ambiguous about them. Since I don’t have a reference point, it’s hard to say whether this trip was typical; however I was very impressed by the fact that, even though the trip was sponsored by the King and Prince, we were exposed to a myriad of local vendors, growers, producers and attractions. It really felt like an educational opportunity, and in that sense it was an extremely enriching experience. This is the first in a series of posts focusing on what I learned over the course of three days. 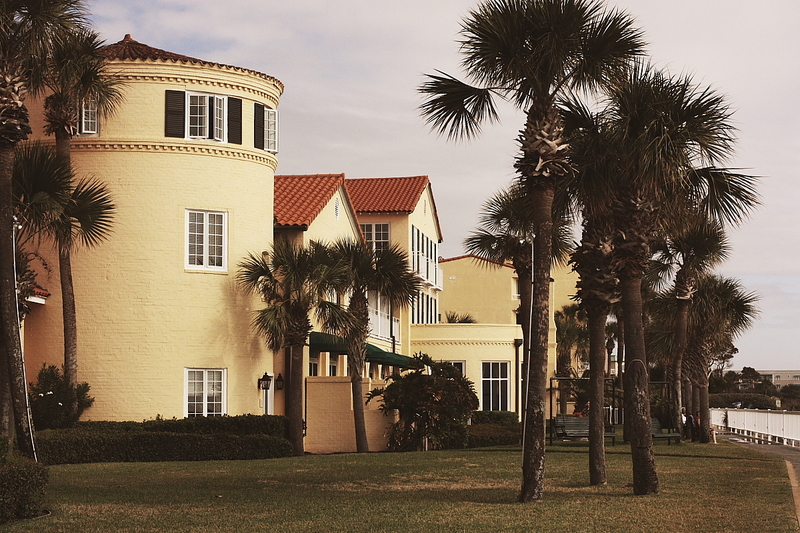 The King and Prince is a historic hotel, opened in 1935 as a seaside dance club. It has seen many iterations over the years, including serving as a naval coast-watching and training facility during World War II. 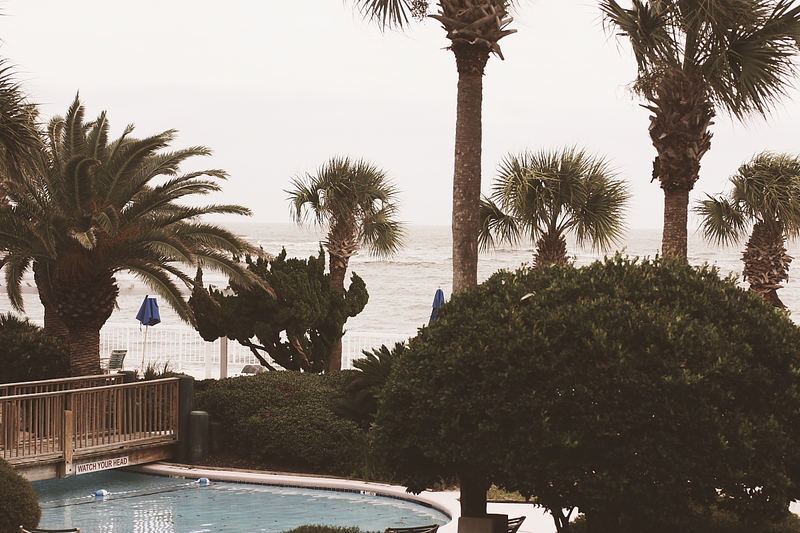 In its current state, it is an elegant resort with multiple dining options, five swimming pools and it boasts the distinction of being the only beach-front hotel in St. Simons Island. The rooms are spacious and comfortably appointed. Each room has a Keurig coffee maker, mini-refrigerator, free wi-fi, flat screen television and either one king or two queen beds. 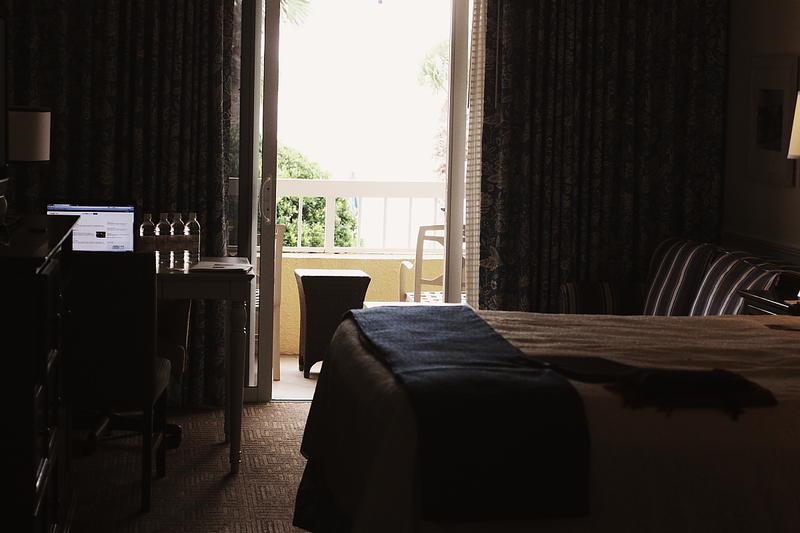 My room had a small balcony overlooking the pool and the beach and ocean beyond. There are a number of premium rooms available, as well as villas and resort residences. 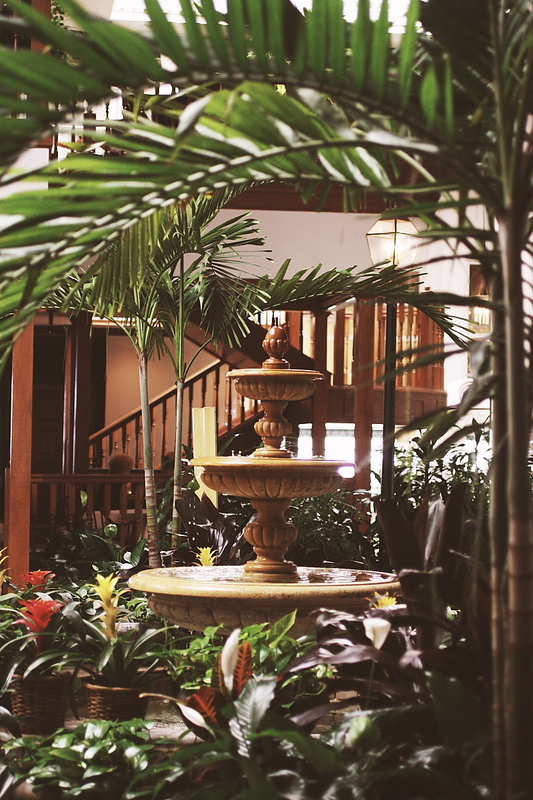 When we arrived at the King and Prince on Sunday, we were greeted by a light-filled lobby, a friendly reception agent and the hotel’s publicist, Leigh Cort. We had time that afternoon to get settled in our rooms and then it was off on the Lighthouse Trolley for an excursion to the old Coast Guard Station and Maritime Museum. St. Simons Island has a storied past spanning the prehistoric and historic eras and rife with interesting tidbits related to Native Americans, Spanish explorers, Revolutionary war battles, rice and cotton plantations, Gullah Geechee culture, and German U-boats. The Coastal Georgia Historical Society offers a number of different programs related to the history and culture of St. Simons. Upon our return to the hotel, we were treated to cocktails courtesy of 13th Colony Distillery, and an assortment of cheeses from Flat Creek Lodge Dairy. The hotel’s Director of Food and Beverage, Vinny D’Agostino, is making a concerted effort to incorporate local and regional products into his various menus, and these are just a couple of the vendors with whom he’s been working. Although he’s only been with The King and Prince for a short while, he’s making significant changes to their Food and Beverage Program, using wild-caught seafood, most of it from local and regional waters; incorporating prohibition-era cocktails utilizing spirits from 13th Colony; Featuring Georgia vineyards on the Wine Menu; working with the Georgia Olive Growers Association to get the word out about their product; and partnering with a variety of other growers and producers to round out his offerings. 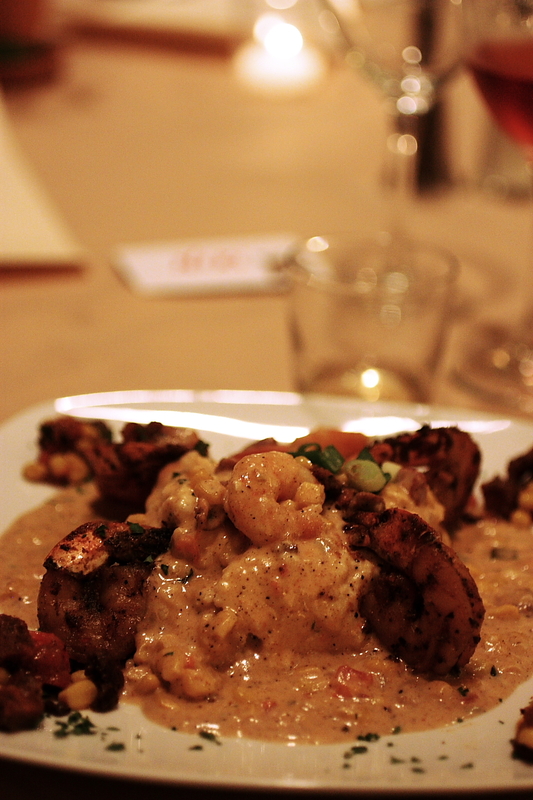 For dinner, we dined on shrimp and grits. The hotel’s chefs did a cooking demonstration in the Solarium, and they were kind enough to share the recipe with everyone so that we could try it at home. Dinner itself was lovely, both the food and the company. 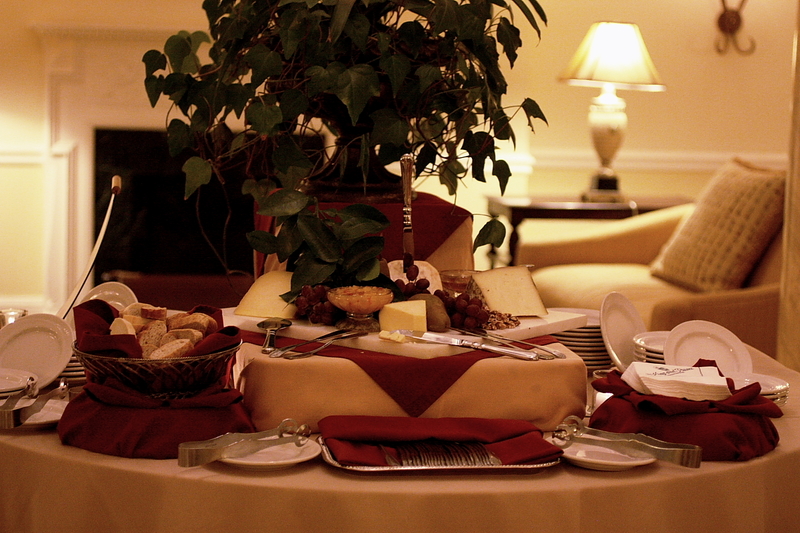 Although it was our first night together as a group, the conversation flowed as easily as the food. I’m sure some of that could be attributed to the abundant cocktails and wine, but I also think it has a lot to do with the setting and the simple act of breaking bread together. 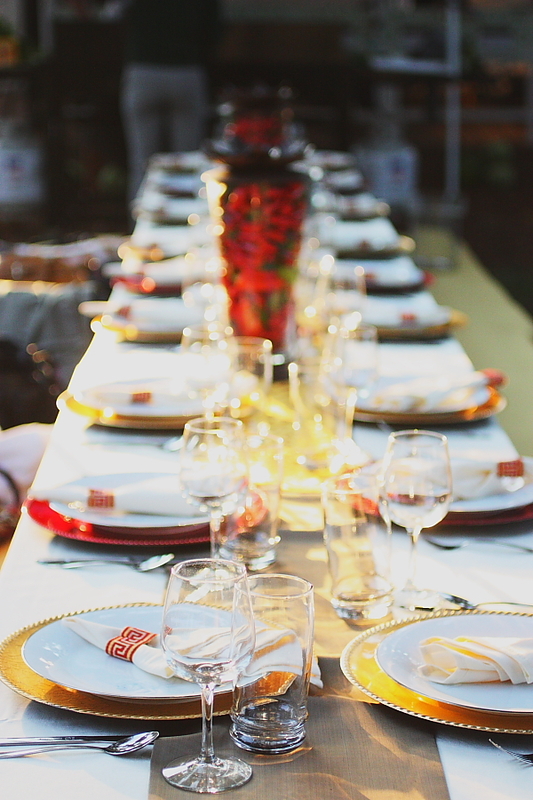 Food is the great equalizer (we all have to eat), and when you enjoy a meal together, you’re sharing more than just the food – you’re sharing stories and experiences that might not otherwise be revealed in a different setting. The fact that this trip centered on food gave us all an opportunity to get to know each other in a comfortable setting over delicious cuisine. 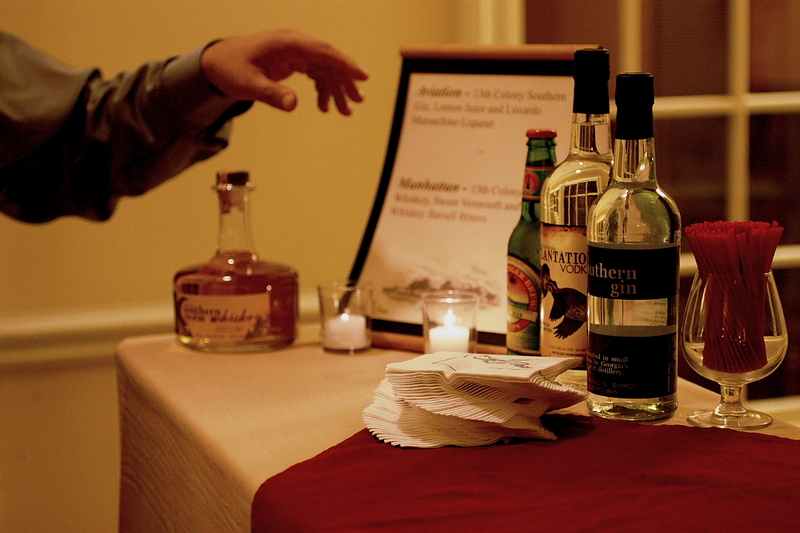 Again, the wine and spirits didn’t hurt matters at all. My first experience with Shrimp and Grits was at Crook’s Corner in Chapel Hill, North Carolina back in the mid-nineties. Since then I’ve tried a number of different variations on the same theme, but have not, until now, encountered Shrimp and Grits to rival those at Crook’s. The version that Vinny and his team presented to us on Sunday night might just have surpassed them. 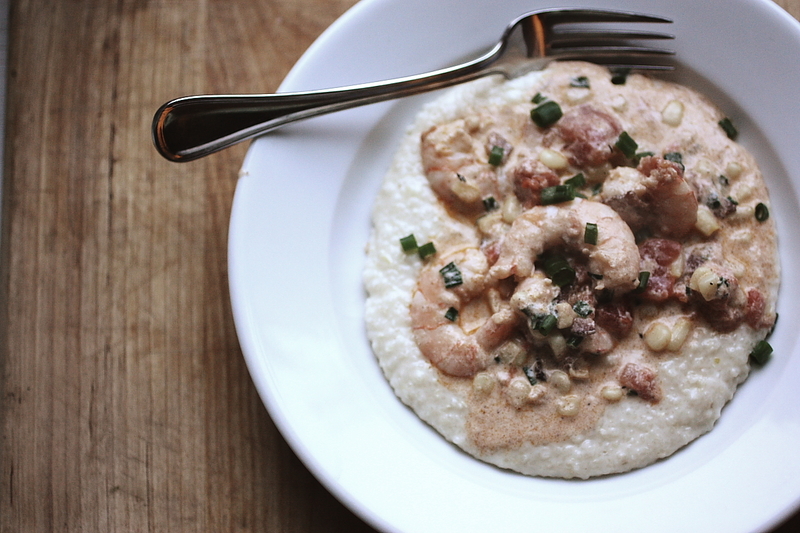 The combination of cajun spices, tasso ham, whole kernel corn, stone ground grits, sweet white Georgia shrimp, and a rich cream sauce came together to create a well balanced combination of flavors and textures. It was so good that I recreated it for my family when I got home. We will make it back down to St. Simons Island and The King and Prince sometime in the near future, I feel certain of that. In the meantime, I can share the culinary souvenirs that I brought back and spread the word about this quaint little island and all that it has to offer. Prepare grits according to package instructions. 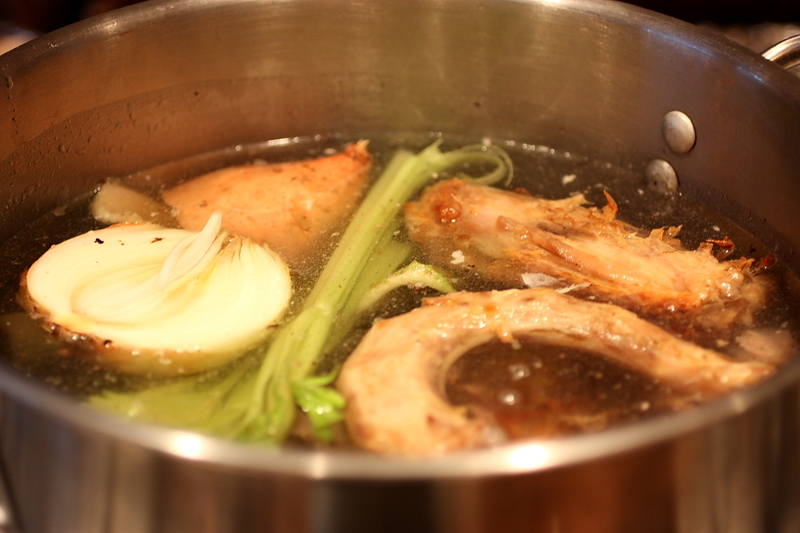 For more flavor, replace the cooking water with chicken stock. Chop meat (either tasso ham or bacon) into small pieces and saute in a large skillet over medium heat until crispy and all of the fat has rendered out. 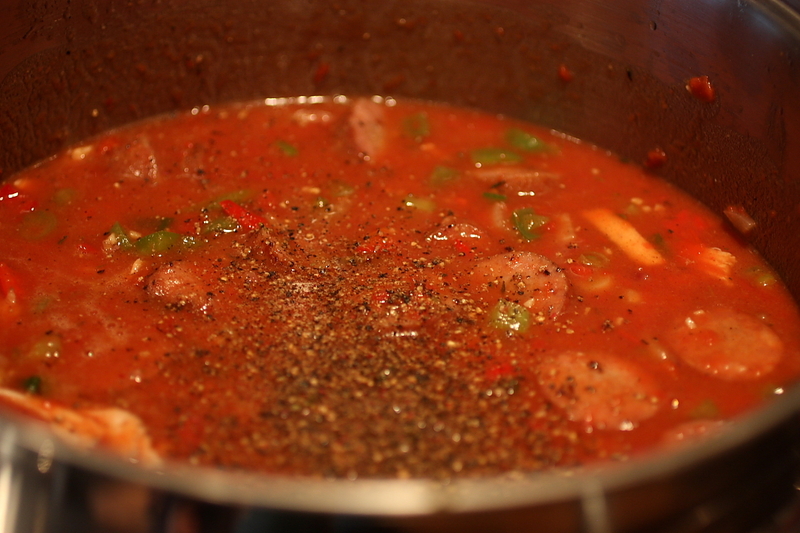 Add the corn, tomatoes, garlic, cayenne and thyme. Stir to heat through. Add 3/4 cup of the half-and-half and 3/4 cup of the cheese. Stir to combine and remove from the heat. 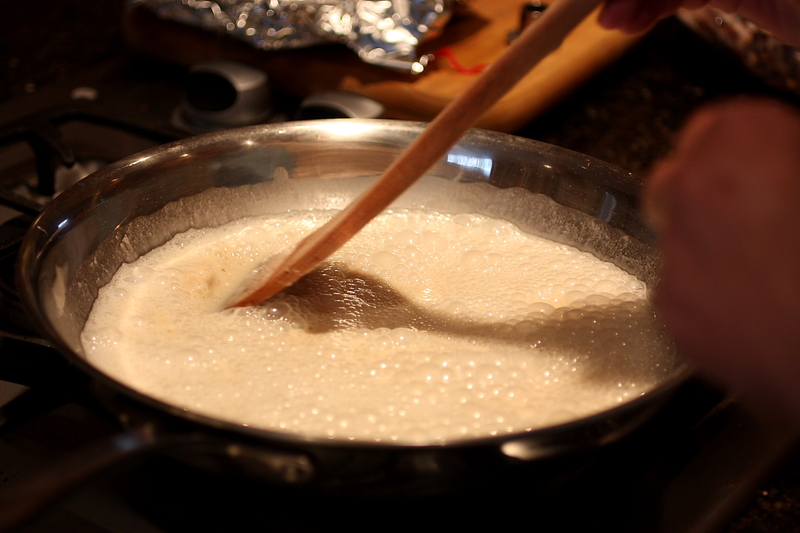 Add the remaining half-and-half and cheese to the grits and stir to combine. 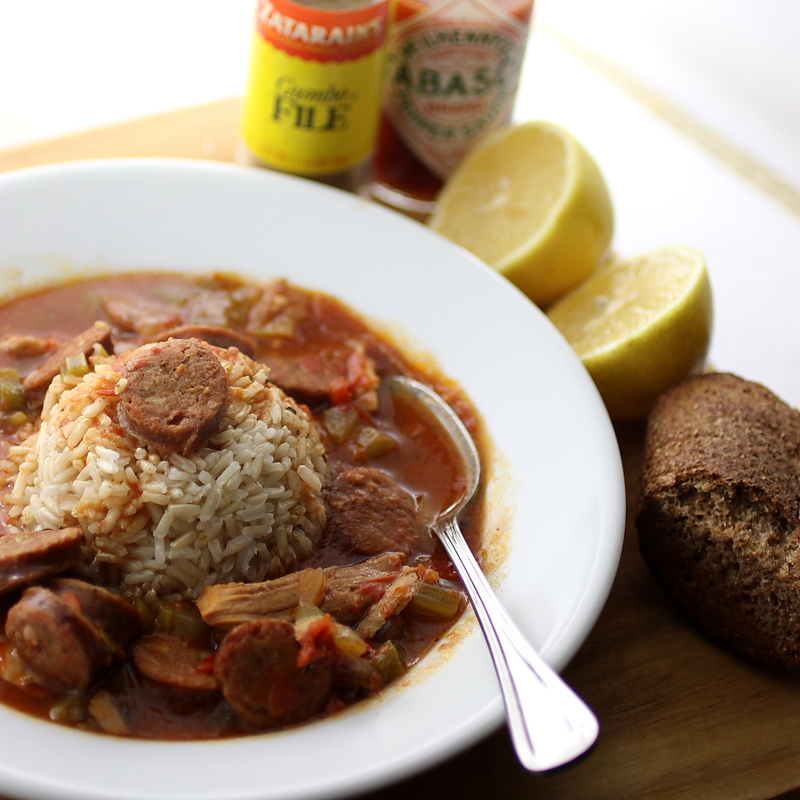 Taste both the shrimp mixture and the grits for seasoning. Add salt and pepper to taste. 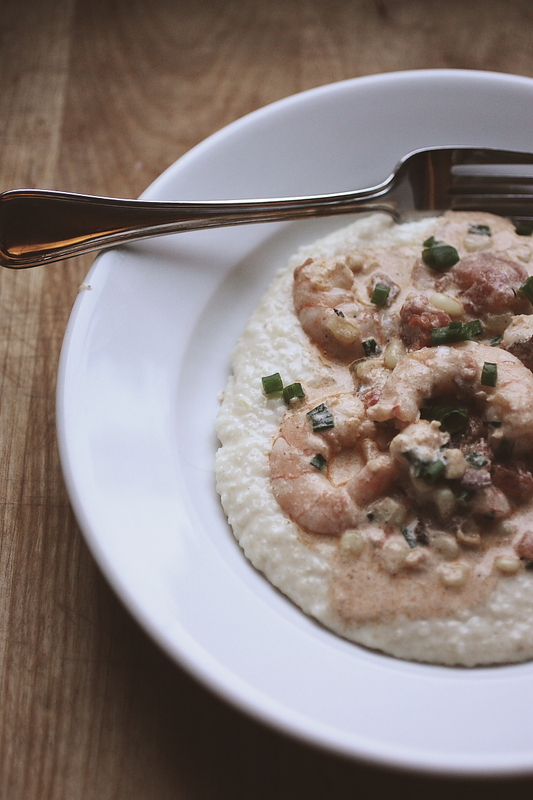 Serve shrimp mixture spooned over grits. Garnish with additional green onions and cheese. Disclaimer: While our accommodations and food were provided by the King and Prince Beach and Golf Resort, I was not compensated for the trip and the opinions in this post are mine. I was under no obligation to write about my experience, but I felt compelled given how much I enjoyed my stay. Thank you to our hosts and to the residents of St. Simons Island for a truly memorable time.